Executives explained why the consumer goods giant's sales growth decelerated in fiscal Q3. On Tuesday, consumer goods titan Procter & Gamble (NYSE:PG) took a step back into a decelerating growth pace as its quarterly organic sales improvement fell to 1% from the prior period's 2% gain. After the announcement, Chief Financial Officer Jon Moeller held a conference call with investors to put the slow-growth results into perspective. Here are a few can't-miss quotes from that presentation. 1. "We do continue to operate in a challenging and volatile macro environment." P&G's 1% organic growth marked the seventh time out of the last eight quarters that its growth rate has either held flat or declined. The figure also compares poorly to rivals like Unilever (NYSE:UL), which expanded sales by 5% last quarter. Moeller explained that much of that weakness had to do with market forces that are beyond P&G's control, including economic and political instability in places like Venezuela, Brazil, Russia, and other hotspots that together account for a greater percentage of its sales than of its competitors'. 2. "This top-line pain is worth it." Adding to the sales growth pressure is the fact that P&G is dumping what it considers to be underperforming brands. As an example, Moeller discussed exiting the value tier of toilet paper products in the Mexican market in favor of higher-margin options. Trimming the portfolio has resulted in a significant sales hole, but profits in that segment have gone from "very negative to nicely positive," he said. That's a small example of what P&G hopes to achieve with its entire business in the coming years. 3. "Some bright spots are emerging, but it will take time to get fully back to target growth rates." Parts of P&G's trimmed-down portfolio performed well this quarter, especially its fabric care and baby care lines led by Tide and Pampers. Still, competition ate away at market share for other brands like Luvs and Gillette. The company is pouring resources into innovations and improvements across its portfolio, but warned investors that "improvements in top-line growth won't happen overnight, and they won't happen in a straight line." Indeed, the company predicts roughly flat organic sales for the full fiscal year that ends in August. 4. "We generated $2.5 billion in free cash flow, yielding 105% adjusted free cash flow productivity." 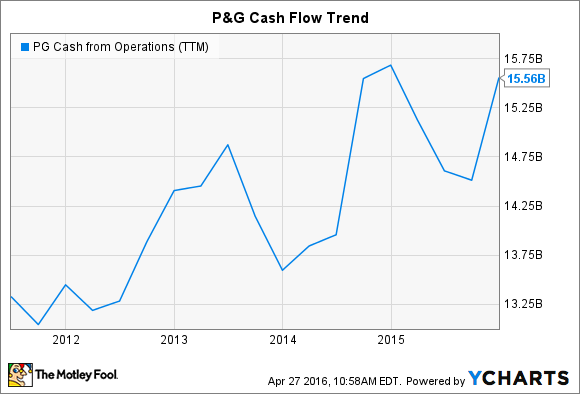 Cash flow has been a big bright spot in P&G's finances thanks to years of cost cuts and productivity gains across its operations. The company's original $6 billion target for cuts in annual costs of goods has already been achieved, and the savings rate should hit over $7 billion this year. That success has helped free cash flow productivity jump to well over 100% of earnings. After touching 102% last year, that metric has been 101%, 117%, and 105% in the last three quarters, respectively. As a result, P&G has the ammunition it needs to fund one of the most aggressive cash return policies in the market. 5. "The size of the dividend increase reflects [foreign exchange] headwinds, the cash impacts from streamlining and strengthening the business unit portfolio, and our plans to increase investments in the business to accelerate top-line growth." P&G recently announced the tiniest of dividend increases, which executives said was due to several headwinds including a strong U.S. dollar, lost business from brand divestments, and competing priorities for cash. Dividend raises by year. Data source: P&G financial filings. The company is also clearly aiming to bring down its elevated payout ratio that passed 100% of earnings last year. With 2016's small increase, though, and rising operating profits, the payout ratio should improve to around 70% this year.